Selectable 33/45/78 RPM speeds settings. Front-facing built-in speakers provide great sound. With RCA and headphone jack outputs/ line in port mounted on the side, easy to operation and support multiple music playback modes. Wooden cabinet with PU leather wrapping, the briefcase-styled turntable is lightweight, easy to store and transport. Starting today, and running until Friday, 12/11/15 at midnight, you can get this combo record/music player that also let’s you listen to all your favorite digital music from your iPad/iPhone/iPod, at a steep discount. Simply enter the Coupon Code T4FZXUOH when checking out at Amazon, and save an additional $20 off the retail price. 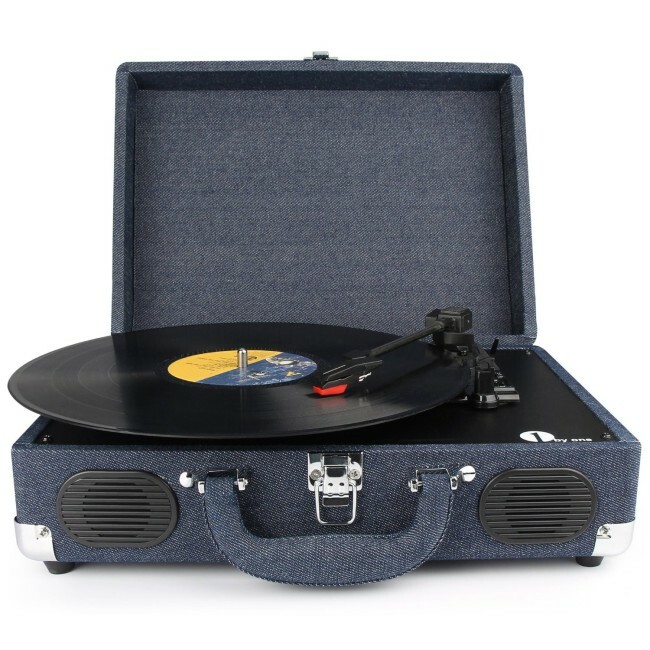 That means you can purchase your very own black, turquoise, or denim colored portable turntable for only $56.99 with free shipping included! In an independent survey recently completed at the North Pole, 9 out of 10 elves agree MOBiLE CLOTH is the Best stocking stuffer for the third year in a row. On a more serious note MOBiLE CLOTH has been reviewed enthusiastically by many tech writers including iPadinsight’s own Patrick J. as a fast, effective, and safe cleaning accessory…your friends and family will love them and thank you! Well you heard it here first folks… MOBiLE CLOTH is the stocking stuffer of choice of the pros. Don’t be a Cotton headed niny muggins, get some for your family and friends before they run out! If you are a new iPad user or a seasoned veteran you are very aware of the constant fingerprints and smudges clouding up your beautiful “retina” display. MOBiLE CLOTH is easiest, fastest, safest solution. 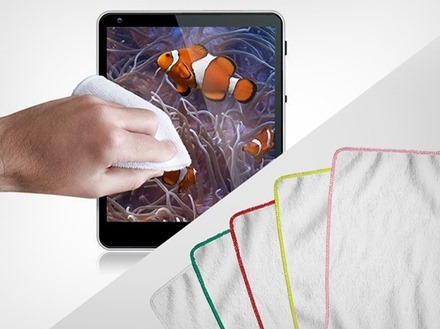 A few swipes with our unique cloth and your screen will look like it just came out of the box! Patrick J. of iPadinsight.com included MC in a top ten accessory list. 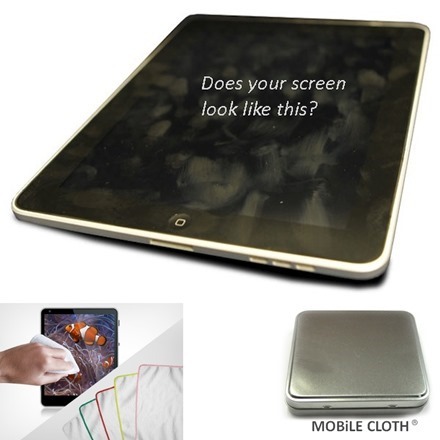 Canada’s largest iPhone/iPad blog exclaimed “it’s the best cleaning cloth I’ve ever used” and Beatweek Magazine gave MC “5 out of 5” stars. 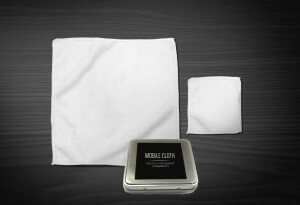 The MOBiLE CLOTH DUO gives you the best of all worlds and powerful weapons in the battle against fingerprints. The nano 4″ x 4″ is built for super speed and compact power when a dirty touchscreen situation arises. In case you need some backup we have included the nano’s bigger brother MC Classic! At 9″x 9″ the Classic won’t back down to any fingerprint or smudge no matter the odds. To top off this dynamic Duo we have included our NEW slim line case to keep everyone safe, clean, and ready for action! At only $11.99 Dad will be proud of your economic sensibilities! All Dad’s Love A Great Deal! For some people, IT is a task and not a career. Bushel is a simple-to-use cloud-based tool that anyone can leverage to manage the Apple devices in their workplace. Bushel allows you to easily set-up and protect all of the devices that you distribute to your team, or those that your team already has. Provide access to company email accounts, automatically install work apps to every device all at once, and separate and protect your team’s personal data from company data. If a device is ever lost or stolen, you can remotely lock it or wipe company data completely. 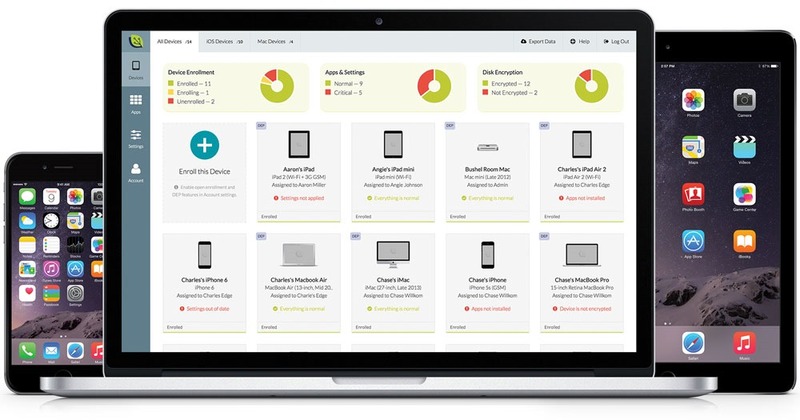 All wrapped into one seamless interface so you can manage those devices when you want, wherever you are. Bushel makes the complex simple, so you can focus on what matters most. Your first three devices are free forever, and each additional device is just $2 per month with no contracts or commitments. Learn more at www.bushel.com. 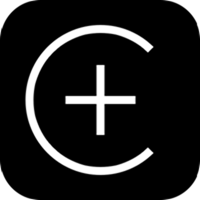 Centrallo today officially released their global productivity tool that helps people organize, centralize, prioritize and share their lives. Developed over the past few years, Centrallo is a better, more modern alternative to the leading productivity tools on the market today. Built originally to solve the founder’s personal, professional and life organizational challenges, Centrallo provides a flexible and simple tool that will fit anyone’s organizational habits – and we’re offering iPad Insight readers a free premium subscription for 6 months to try it out! Simply sign up from any device – iPhone or iPad here, Android here or Web here. To receive your six-month free premium subscription, then go to www.centrallo.com, then Settings, then enter promo code: ipadinsight. Fine Craftsmanship from rainy Northern Germany meets modern technology from sunny California. High-grade materials and flawless manufacturing ensure an appealing surface feel. Our elegant iPad holders always offer you an optimum view on your iPad due to the multiple angle feature. Small cutouts within the holding arms of the stand allow for optimum sound from the iPad speakers while in the stands. TUBLET is a combination of the words bathTUB and tabLET. The neologism illustrates the purpose of the wooden iPad stand as a „bathtub surfboard“. Watch movies on your iPad while taking a relaxing bath, listen to music or read about breaking iPad-news at iPadInsight.com. If you‘ve guessed that the word TOPLET combines the words deskTOP and tabLET you‘re absolutely right. You can use it for cooking in the kitchen, working in the office or playing online poker in the living room. Do you own a local retail store? Check out TOPLET to enhance your product presentation. Our attractively designed iPad stands are handmade with love and available for the iPad generations 2, 3, Retina, Air and Air 2. If you‘re looking for something unique or a perfect Christmas present for an enthusiastic iPad user you should definitely visit our Etsy-Shop. As a friend of iPadInsight.com you save 10% by using the following coupon code: HEISENBERG. Tired of having to lug your laptop and thumb drives along every time you have to make a presentation? 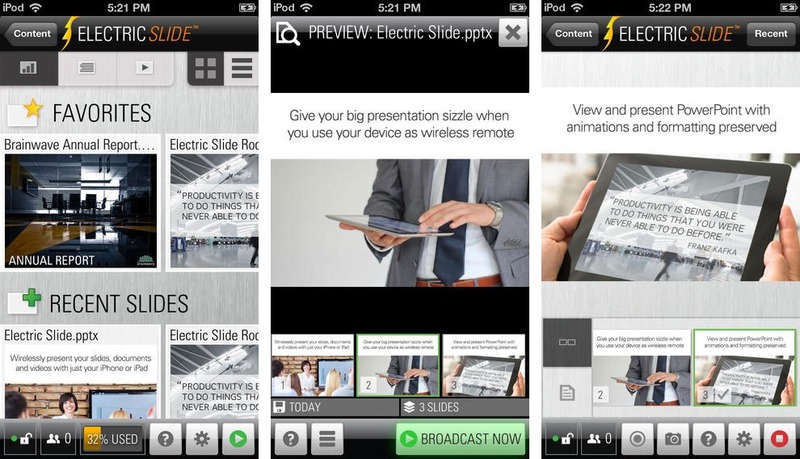 Electric Slide lets you control your Powerpoint or Keynote slides, documents, and videos, on any web browser, TV, or projector, with just your iPad or iPhone. Type a simple url into a browser and present wirelessly from your iOS device or broadcast to a nearby Apple TV with AirPlay. Electric Slide syncs your files to your device so you can even present when you’re offline—just plug directly into a projector and you’re good to go. iPad Insight calls Electric Slide “the best presentation tool I’ve seen for the iPad.” Get it free on the App Store today! 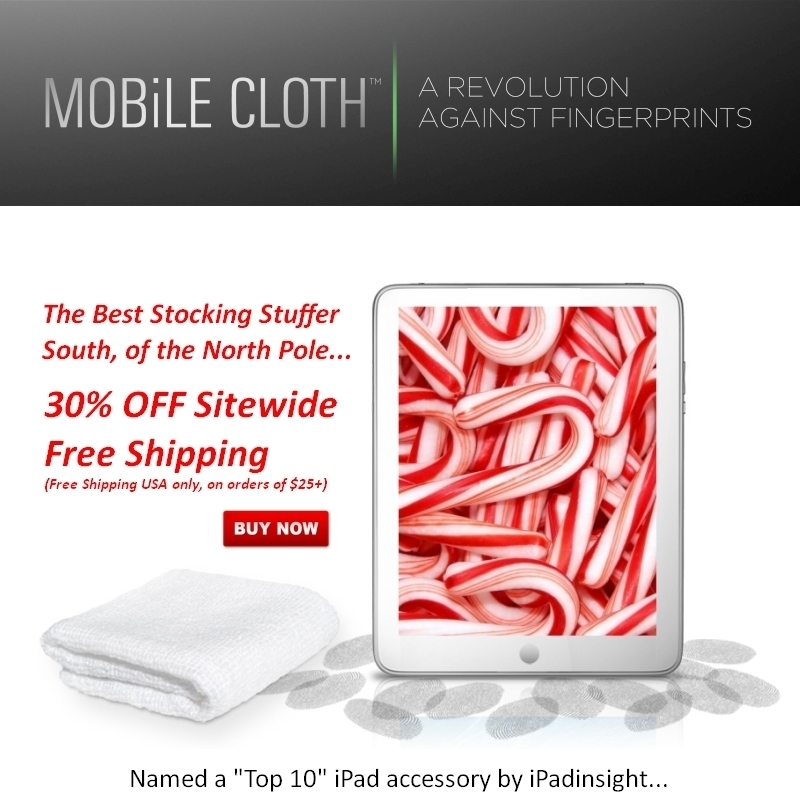 Thanks to Mobile Cloth, sill my favorite way to keep my iPad screen clean, for being a site sponsor again this week. Check out the great video above, done by my friend and colleague Thomas Wong, to see how effective these are.